What is the commodity of the cargo? – Should the assets be classified as Biomedical or Pharmaceutical, SGL will have the items packaged and labeled, Dangerous Goods Declarations cut if necessary and routed according to MSDS instruction. Containers with insulated foam inserts are purchased if not already packed by manufacturer properly. Materials that can melt or thaw are bagged in watertight plastic containers. Void space is filled with dunnage such as peanuts, bubble wrap, brown paper, etc. Close the liner bag (if used) but do not completely seal it, as the carbon dioxide gas created by the dry ice must be allowed to vent. Place the lid on the insulated container. Place the insulated container inside an outer corrugated box. Close and securely tape the carton. 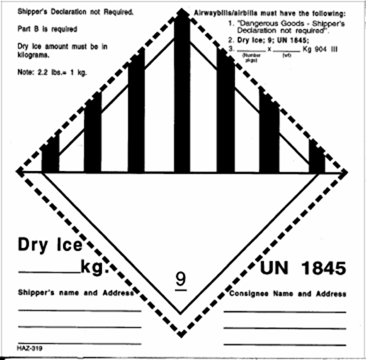 Net weight of dry ice in kilograms. Name and address of the shipper. Weights and Dimensions, Origin and Destination, Commodities and any “temperature sensitivity” information is provided to several Air Carriers and Destination Agents for Quote. Routing and Carriers used is contingent upon Express Services offered and ability to transport dry ice or hazardous material shipments to the destination regions to ensure frozen materials maintain a constant temperature during transit. Does the cargo require refrigeration? Refrigerated materials that can melt or thaw are bagged in watertight plastic containers. Labels are created to include the Shipper and the Consignee information and placed on the outside of the carton. Carton is closed and securely sealed. Shipments of refrigerated items are avoided over holiday periods and weekends to avoid possible transit delays.